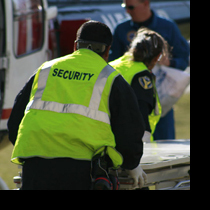 The ESI Health Care Division offers security services with a specialized focus on hospitals and medical environments. As your security provider, we will assist the hospital staff to ensure a secure place to work and an environment conducive to rest and healing. Our services will provide you with the many benefits that can only be achieved by ESI Security Services. ESI will develop a structured, successful, and well-organized security system that allows your security officers to be quickly accessible for all your needs and concerns. As a part of your team, ESI will create a safe, secure, and pleasant environment for all who visit your medical facility. Utilizing over 80 years of combined experience in customer service and security, ESI will tailor a training program specifically for your facility. We will work hard to make sure that each security officer is a proper fit for your medical facility, staff, patients, and clients. With our experience and professionalism, we give you a security team that provides quality service and ensures your facility is in the best hands.